The extent of my on the water experience has been bumper boats, small fishing boats a very few times, Disneyland's jungle cruise, and sailings on huge cruise ships. I had never had my body in the open water other than ankle deep at the beach and once during a one day trip as a teenager tubing down the Salt River over four decades ago. I have never had any interest to get into what I consider to be wild water. This summer a new family activity was added when my daughter and her husband bought a new ski boat. The trips to the lake have been ample all summer long. 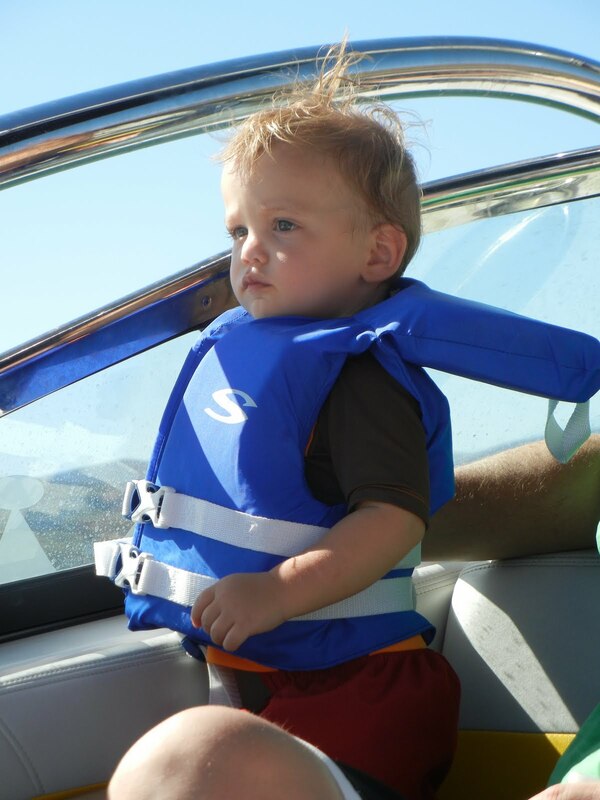 Most of my grandchildren had spent long days at the lake. As I pictured my little grandchildren out in the middle of a lake..... (IN THE MIDDLE OF THE LAKE!!!) all I could do was say a silent prayer asking for their safe return. Unknowing to my daughter and her family who live just down the street I have not gone to sleep before seeing that they had safely returned from each day trip to the lake. THEN, my now seven hear old granddaughter decided that she wanted our entire family to join her on her family's boat for her 7th birthday. I was now faced with actually seeing my grand children's little heads bobbing out in the middle of the lake or falling from the knee boards, tubes, and wake boards in 300 feet of water! How on earth was I going to be able to see them out in the middle of the wild water? Was it going to be even worse than what I had been picturing in my mind? As the days neared to sail all I could do was muster enough courage to say I think I can, I think I can do this. Before I knew it we were all on board and we had jetted to a quiet cove on the lake. The quiet and the stillness of the lake actually calmed me. I began to feel that I can do this. My entire family unit was enjoying a little piece of this beautiful planet all by ourselves. The kids knew the routine and they began plopping into the water to get cooled off. The ten adults could surely keep the ten children who were safely zipped and strapped into life jackets safe. Right? Six of my ten little bobble heads! I quickly saw how much the grands loved this new and exciting activity and I became excited for them. The birthday girl had an ear to ear smile on her face! Because this lake is in the middle of the Arizona deserts and it was August I was forced to jump into the wild water myself to cool myself down. We had hours and hours of fun on the lake. and me and the grands. My youngest grandson took it all in. Over five decades younger than I had! Before we knew it and long before the kids had ran out of energy and excitement the sun was setting. It was time to return to shore. Can you believe it? I was actually sad to see our day ending too. I had captured the joy that a day on and IN the wild water can bring to a family. No cell phones, no business talk, many helping hands, smiles, giggles, squeals, hugs, and hours and hours of quality bonding time. Once we were off the lake our day together wasn't over. We had reservations for a birthday dinner and birthday cake on our way home. Eight of my ten little pearls after a day at the lake. After dinner and as we were all headed home to complete our fifteen hour day together I was filled with gratitude instead of fear for this new outdoor activity for our family. All because of a seven year old granddaughter who wanted to spend her birthday with her entire family I was able to turn I think I can into I know I can, I know I can. It sounds like all of you had a wonderful day! I can remember wake boarding as a little girl back in Michigan -- it was awesome! Wow! That would be hard the first time. I remember the first time out in public with our first grand child. I was on double alert for anything that moved! It's harder for us Gma's to relax I guess. Yes, you are a lucky grandma!What a beautiful day. How touching... so neat ... that you can all do something so brave! When I was little my dad had a speed boat and we lived summers on the lake. I don't have any desire to be on a boat or out in the wild water but your adventure sounds great because you were all together. You grands are so cute! Congratulations on overcoming your fears. My grands love to tube and ride the various contrivances that can be pulled behind the boat. It makes me a little nervous, but they do have a great time!